Sports safety rules should be followed. The experiment should be supervised by an adult. This science fair project was performed to ascertain the distance traveled by a ball when hit with an aluminum bat and with a standard wooden baseball bat. The science project experiment involved the participation of experienced baseball players. A baseball will travel further when hit with an aluminum baseball bat, rather than a standard wooden bat. 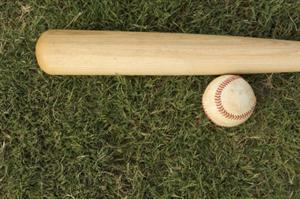 Baseball bats were originally made from wood. However the wooden bats have one big disadvantage - they break fairly easily and send splinters flying. Aluminum bats were introduced in the 1970s and were initially adopted by the Little League and later by the amateur leagues. Wooden bats are heavy and therefore allows a batter to hit the ball harder. The harder the bat and the faster the swing, the harder the ball will be hit and the further it will fly. The center of gravity of the wooden bat is located further away from the hand making it feel heavy near the end. Wooden bats are also better for the batter’s hand because they produce less vibration. For an experienced player, the wooden bat is packed with more power and this allows the player to drive his ball further. Aluminum bats, on the other hand, are easier to use and provide the batter some additional time to adjust the swing. 1. For this science fair project, the independent variable is the use of aluminum bat or wooden bat. The dependent variable is the distance traveled by the ball. This is determined by measuring the distance using the measurement tape. The constants (control variables) are the skill of the batter, the skill of the pitcher and the baseball balls used. 2. The baseball batters are assigned numbers 1 to 10 and asked to warm up and practise before the experiment is started. 3. The first batter is asked to prepare to hit the ball with the aluminum bat. After the ball is hit, the distance traveled is measured using the measuring tape with the help of the assistant. The ball is hit 3 times using the aluminum bat and the average distance traveled is calculated and recorded. 4. After 15 minutes rest, the first batter is next asked to hit the ball using the wooden bat for a total of 3 times. The distance traveled by the ball is again measured and the average distance calculated. The result is recorded in the table below. 5. Procedures 3 and 4 are repeated for the remaining 9 batters. The distance traveled by the ball after every hit is measured using the measuring tape. The average distance traveled by the balls are calculated for every player and recorded in the table below. 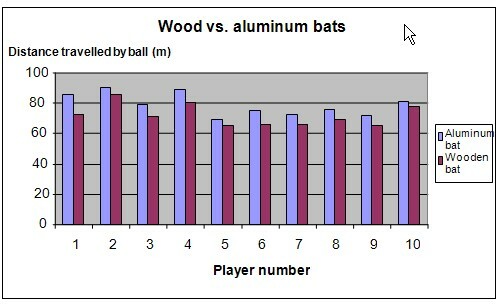 The results show that the ball traveled the furthest after being hit with the aluminum bat, compared to the distance traveled by the ball when hit with the wooden bat. The chart below represents the results of our science project. Our hypothesis has been proven to be correct. A baseball will travel further when hit with an aluminum baseball bat, rather than a standard wooden bat. Young baseball players like to use aluminum bats. This is because aluminum bats are cheaper and easier to use. Wooden bats have a different feel and are heavier. This makes it difficult for young players to learn how to use wooden bats. This is the reason why more tournaments are being held using wooden bats – in order to help younger players adjust. This science fair project can also be repeated by comparing different brands of wooden and aluminum bats. This science project can also be modified by measuring the speed of the ball.